An incredible 13 documents covering most aspects of electrical health and safety based on our professional experience and our customers download trends. All 13 documents have been compiled into a single electricians health & safety package which is available for instant electronic download. 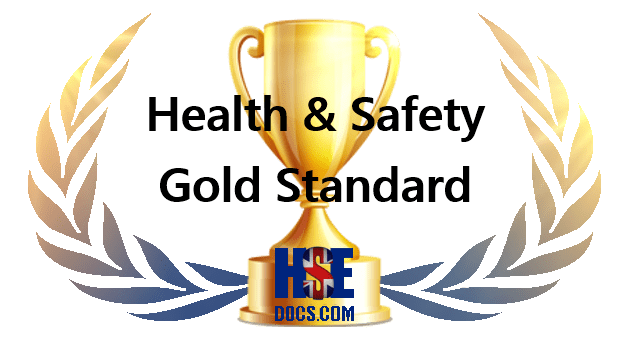 Furthermore, buying this RAMS package allows you to display the "Health & Safety Gold Standard Award" on your website, letting clients, customers and contractors know that your H&S is current and up to date. Not only will your electrical RAMS be current and up to date but it will stay that way, because as H&S changes we update this package to reflect new trends and laws. You buy the electricians health & safety package once and it's yours for life to download as often as you need and each download will always be the most up to date version. If you bought these electrical RAMS individually they would cost you £115.00. Today the electricians health & safety packageyou is yours for better than half price at just £55.00. All you need to do is add your company details to the first page and your H&S package is ready to go. As with all our documents, this is in Word™ format and available for instant download. These are probably the only electrical RAMs you'll ever need and once you buy and download this document, it’s yours for life to use over and over again. Have a look at the table of contents below or view screenshots of the entire package HERE to see what you get for your money and what an incredible offer this package is for just £55.00.